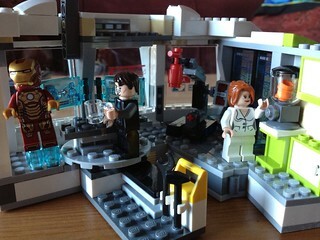 My recent obsession with Lego was pretty clear in this previous post. Since that first bigger build, I have continued to make things and have also since moved on the next Iron Man set, which I have dubbed "Tony Stark's Malibu Dream House"-There was a helicopter too, but the house portion is much more interesting. Look how awesome this is?!!? It comes with a Dummy (at the ready with a fire extinguisher), and a drink dispenser (that I think is filled with Tang). Ok, but as cool as that is, that's not what this post is about. 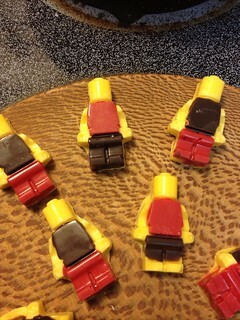 Rather it's about how the perfect storm of a Lego mini-figure obsession, and extreme curiosity about those multi-color candy melts I always see in the craft store come together to make an adorable (if not slightly labor intensive) snack. 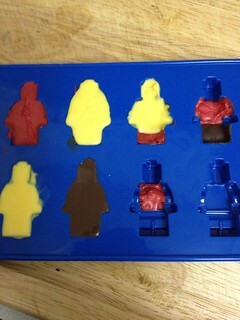 a silicon mold (like the kind sold for making ice cubes)- obviously I am using a mold that looks like Lego mini-figures, but you can pick what you like. 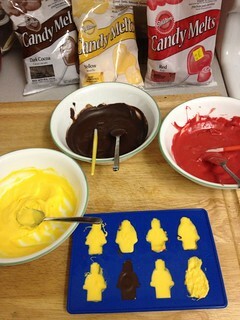 So, you could do this pretty straight-up easy, melt one color of candy melts, pour into mold, wait, pop out, eat. But that my friends is not what's happening here. 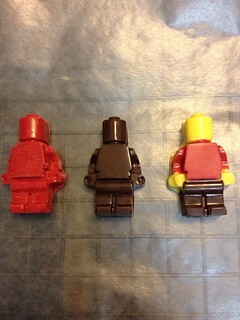 Not when I have the opportunity to make the Lego peeps wear different color pants! Instead I set up all 3 colors so I could layer in the mold and create. 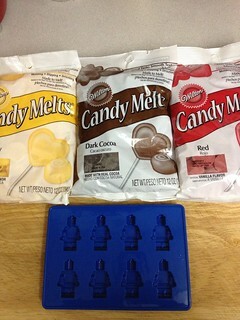 While the candy melts are pretty easy to use-follow the directions on the back for melting, they solidify pretty quickly. This is great when you are waiting to pop out your completed mold, but a bit of a pain when you are trying to build the colors. So that said, you will want to work quick-ish, or the reheating of the candy medium can get really tedious. 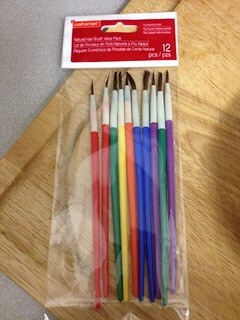 Laying the colors is where the paintbrushes really come in handy. 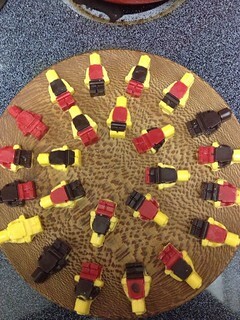 You don't want a cadre of naked mini-fig do you?! Well maybe you do, but this is not that kind of blog, so as you can see, I used the brushes and various colors to create clothes. There you have it. I think it's safe to say this can be done with any of those silicon ice molds, so get creative. I have seen Star Wars and mustache molds used similarly. Full disclosure- I liked making these more than I liked eating them (Candy Melts are basically white chocolate), but they were gobbled up super quickly at the party I brought them to, so I consider that a success. Friend of the Ladies and super great artist Erica Henderson has launched a Kickstarter to overhaul the popular Lovecraftian children's book, Baby's First Mythos. There are some great incentives and new stretch goals for the project. We think if you are reading our blog this might be relevant to your interests, so please check it out!